As the masterminds behind Marvel comics in the 1960s, Stan Lee and Jack Kirby attracted a passionate following, and the dissolution of their partnership in 1970 occasioned much grief among superhero cultists. But few would have guessed that the ramifications of their fruitful collaboration would still be felt four decades later. Together, Lee and Kirby gave the world the Hulk, Thor, Iron Man, the Black Panther, the X-Men, the Avengers, and hundreds of other characters who form the bedrock of Marvel Comics, generating billions in revenue for Hollywood and the video game industry. This Friday, moviegoers will get to see the rebooted version of the Fantastic Four, a Lee/Kirby creation which more than any of their other works speaks to the contentious nature of their collaboration. Kirby in particular offers a fascinating prism for the question of whether cartoonists work best in collaboration or as solo auteurs, since at various points in a career that spanned seven decades he flourished both as a team-player and as one-man band. The Fantastic Four is a super-hero team which is also a bickering, barely functional family. Reed Richards, the shape-shifting Mr. Fantastic, is an egg-head scientist and supposed head of the team, but he’s a paterfamilias who gets little respect from the others. In particular, he’s constantly berated by Ben Grimm, who blames Richards for the scientific mishap that turned Grimm into the Thing, a craggy rock-monster and gave the others their powers (in the original version of the story the powers are a by-product of an ill-fated space trip hit by radiation, in the updated movie rendition, the accident involves an attempt to enter another dimension). In the early comics, the Thing is always berating Mr. Fantastic, variously describing him as a “weakling,” a “rubber-man,” a “lunkhead” and would-be “big-shot.” Richards also dates Sue Storm (a.k.a. The Invisible Girl a.k.a. The Invisible Woman), who dates and eventually marries Richards but finds him such an imperfect lover that she persistently hankers after the supervillain (or antihero) the Submariner. Adding to the friction in the group is Sue’s younger brother, the hot-headed Johnny Storm, who flames on to become the Human Torch. The Fantastic Four often spend as much time quarrelling with themselves as fighting the bad guys, and thus stand as an excellent example of the tensions produced by teamwork. As such they also serve as a metaphor for their often feuding creators Lee and Kirby. Although they created thousands of pages of comics together, Kirby and Lee became increasingly hostile to each other in the late 1960s. In interviews and essays, Lee persistently portrayed himself as the sole visionary creator, with artists like Kirby executing his ideas. “Stan Lee and I never collaborated on anything!” Kirby said in a bitter 1990 interview for The Comics Journal, where he noted that he plotted and designed almost all the stories he worked on before dialogue was added by other hands. In his happier moments, Kirby was mindful of the way the Fantastic Four served as an analogue for his working life. 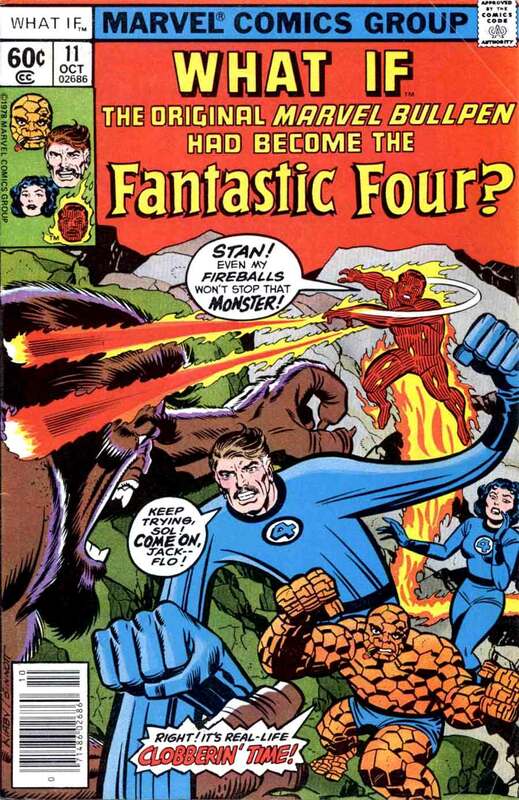 In 1978, Kirby created one of his strangest works, an alternative-history story titled, “What If… the Original Marvel Bullpen Had Become the Fantastic Four?” In this playful riff on canonical Marvel history, Lee became Mr. Fantastic while Kirby was the disgruntled, wise-cracking Thing who constantly mocks the supposed team leader. This alt-Fantastic Four was rounded off with secretary Flo Steinberg as the Invisible Woman and Lee’s second-in-command Sol Brodkey as the Human Torch. Despite its playful tone, this story serves as a reminder that Kirby saw his partnership with Lee and the other Marvel staff as a contentious one, as rife with anger as the Thing’s rocky friendship with Mr. Fantastic. What began as a quarrel between two partners continues as a larger struggle to define their patrimony. Kirby died in 1994, but in 2009 his estate sued Marvel for copyright over characters the cartoonist helped create. The suit was heading towards the Supreme Court when it was settled out of court, for an undisclosed settlement rumored to be as high as the eight figures. The case for comics auteurism rests partially upon historical experience but also upon aspirations for artistic legitimacy. From the rambunctious early days of the newspaper comics to the newfound prestige of the graphic novel, the most highly regarded comics have been created by idiosyncratic single-minded visionaries such as George Herriman, in his memorably quirky "Krazy Kat" strip, and Chris Ware, who not only wrote, drew, lettered and colored his graphic novel Jimmy Corrigan, but travelled to China to oversee printing of the first edition. But most comics collaborations have been the product of commercial necessity. While Herriman crafted each daily "Krazy Kat" strip so they imprinted with the unmistakable mark of his distinctive doodles, many of his fellow cartoonists were happy to hire ghosts to lighten the workload of a daily deadline. A notable example was Herriman’s colleague Bud Fisher, who created the hugely popular "Mutt and Jeff" strip in 1907. Fisher was notorious for partying with showgirls and buying race horses while anonymous assistants kept "Mutt and Jeff" going. These days, "Mutt and Jeff" is only of antiquarian interest, while Herriman’s auteurist strips are still reprinted. The imperatives of auteurism are all the more compelling in the age of the graphic novel, a form that aims explicitly for the legitimacy of literature. In prose fiction, collaboration exists almost exclusively among writers of highly commercial genres like science fiction, fantasy thrillers, and horror. With the literary novel, however, readers expect a personal vision, and collaborations are exceedingly rare. True, Joseph Conrad and Ford Madox Ford joined hands for three novels, but these are generally regarded as inferior items in their respective oeuvres. If literature is the model, the case for comics auteurism is strong. But is literature really the best and only model for comics to follow? Doesn’t the fusion of words and pictures open comics to the rich collaborative possibilities in art forms like opera, where composers often work with lyricists, or theatre and film, where most works are the product of a complex collective effort? As a practical matter, many gifted writers have no skill for drawing nor can every visual artist assemble words with confidence. Kurt Vonnegut Jr. once noted that when young he followed comic strips like Hal Foster’s "Prince Valiant" and Milton Caniff’s "Terry and the Pirates," which were well drawn but “the words and intentions which came along with those remarkable pictures had no weight.” Foster and Caniff might have been better off paired with strong writers. The career of the late Harvey Pekar shows both the promise and peril of comics collaboration. As a would-be cartoonist in the 1970s, Pekar had a keen ear for dialogue as well as a stand-up comedian’s ability to reshape everyday experiences into resonant anecdotes. But he couldn’t draw anything more complicated than a stick figure. His solution was to recruit artists from the underground comics scene to draw the autobiographical stories he compiled in his American Splendor series, which he started in 1976. Luckily, one of Pekar’s illustrators was the legendary cartoonist Robert Crumb. As in all successful artistic partnerships, Pekar and Crumb elevated each other. Many of Pekar’s stories about working class Cleveland life would hardly have their gritty zest without Crumb’s ability to delineate its grubby urban landscapes and schlubby characters. Pekar’s weakness for overwrought monologues was subtly counterbalanced by Crumb’s charmingly dumpy art. Meanwhile, prior to working with Pekar, Crumb’s LSD-inspired surrealistic strips were often self-indulgent. The discipline of working with Pekar made Crumb much more sensitive to language and narratively conscious. “Of all my talents working in the comics industry, my talent for collaboration is my most prized and probably most highly defined and adapted,” Alan Moore, the creator of the legendary Watchman and V is for Vendetta comics, once told an interviewer, adding that he is “a useless brain in the tank without an artist.” But Moore also had major projects fall apart before completion due to disputes with his collaborators. For the young Jack Kirby, working on comics meant being part of a team. When he entered the field in 1936, the emerging mode of comics production was the shop system, an assembly line division of labor that explicitly modelled itself after the sweatshops of the garment industry. Each task (the writing, the drawing, the inking, the lettering, and the coloring) was given to a different person, which facilitated production even as it thwarted individual expression. For Kirby, teamwork wasn’t just an economic necessity but tied to his worldview as a New Deal Democrat. Born in the tenements of New York in 1917, Kirby saw life through the prism of groups: his family, the gangs who ruled the street, the Boys Brotherhood Republic (a youth group that offered an alternative to gang life), the studio he formed with fellow cartoonist Joe Simon in 1940 (which led to the creation of Captain America), the army he was drafted into in 1943. Kirby was anti-individualist and constantly created stories about partnerships and teams: Captain America and Bucky, the Boy Commandos, the Newsboy Legion, Boys’ Ranch, the Challengers of the Unknown, the Fantastic Four, the X-Men, the Avengers, the Howling Commandos, Nick Fury and Shield. Even the very popular romance comics Simon and Kirby created in the late 1940s and 1950s were ultimately about collective experiences, focusing on how families form and fall apart. Kirby’s core belief that human life is a collective endeavor stands in sharp contrast to his ideological opposite among Marvel artists, Steve Ditko. Ditko, even before converting to Ayn Rand’s objectivism in the early 1960s, never cared for groups, but created stories about isolated, often-misunderstood loners, most famously Spider-Man and Dr. Strange. If Kirby was the New Deal liberal focused on groups come to together to overcome historical crises, Ditko was the libertarian who exalted singular, oddball heroes. For Kirby, life was the contention of large historical forces embodied in groups; for Ditko, life is the struggle of the unique person against social forces that try to surpress their individuality. In the Kirby/Lee partnership, a typical comic emerged from a complicated relay race of story and art being passed back and forth. Often, the two men would brainstorm general ideas, then Kirby would draw the entire issue based on a premise, creating new characters and plot twists along the way. Lee as scripter would add dialogue and narration but also his own spin on the story. Yet by the late Sixties, Kirby began to chafe at any editorial interference, and after 1970, became a full-dress auteur, writing and drawing his own stories with only a handful of exceptions, including a half-hearted reunion with Lee in the late 1970s. On his own, Kirby unleashed some of the most bizarre work ever published in mainstream popular culture—apocalyptic comics like The New Gods and The Eternals, which showcased his allegorical vision of Gods and demons fighting for the fate of humanity. Compared with Lee’s wisecracking dialogue and narrative prose, Kirby’s writing was stilted and often awkward, though at times it rose to a level of vatic poetic eloquence. I think Kirby’s 1970s auteurist comics are his best work, the purest view we have of his remarkable imagination. But this opinion is a minority one. Certainly in commercial terms, The New Gods never came close to matching the popularity of the Fantastic Four or the X-Men. Perhaps one lesson of Kirby’s life is that for an artist as idiosyncratic as he was, collaboration is the best way to find a mass audience. Conversely, it was only through auteurism that Kirby gave us his most unvarnished and uncompromised work, which was less popular but more aesthetically satisfying. Collaborative comics certainly have the potential to unleash a creative synergy that would otherwise go untapped. But something is also somehow lost or sublimated. And, as with other crucial human relationships, the problem is always how to find the right partner to help produce something new, beautiful, and alive.